Last winter I received Mary Bell’s Food Drying with an Attitude: A Fun and Fabulous Guide to Creating Snacks, Meals, and Crafts – and I put it aside because I did not have a dehydrator. Like last year, I started this season with drying tomatoes in my oven, but the tomatoes take two full days to dry in the oven at 200 degrees. So I bit the bullet and bought an electric dehydrator– one built for the task. 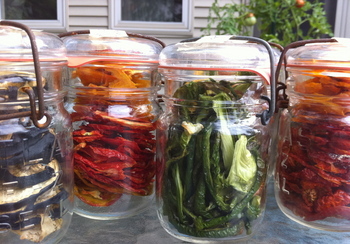 Jars of dehydrated harvest bounty waiting for the winter. I purchased the dehydrator week ago, reread all of Bell’s engaging and intriguing book, and I have not turned the machine off since. I pack hefty tomatoes and gleaming eggplants into airtight jars and debate the pros and cons of dehydrating vegetables vs. canning vegetables. Here are my thoughts so far – I look forward to hearing yours. • Food is considered raw when dehydrated below 105 degrees (because it maintains enzymes and nutrients that are leached by higher temperatures). • The labor involved is minimal. I cut the vegetables at night and pack them into jars in the morning. • The equivalent ingredients take up less room when dehydrated than when canned. • Dried fruit and vegetables do not last as long as canned items. • The labor involved is focused, hot, and continuous. From cooking the sauce, to the hot water bath, to preparing the jars – unlike dehydrating, it does not happen while you sleep. This last point for me is the crux of the matter. A food preservation technique creating results while I sleep is incredible. To me, that is a winning food preservation technique. This entry was posted in On the Farm and tagged canning, Corinna Borden, Dehydrating, Preserves, preserving food, Real Time Farms. Bookmark the permalink.